The best shrimp recipe I’ve come across – best grilled on the BBQ, but can also be grilled in a non-stick pan when the weather is bad. Note for allergies/additive sensitivities: Most shrimp now contain phosphates of some kind – I have an allergic reaction to ‘Tri-poly-phosphates’, but am okay with the ‘Poly-phosphates’ in shrimp. Check the ingredients on the package before buying, especially if you are serving to people with allergies or additive sensitivities. In a large bowl, mix together the marinade: oil, garlic, chili sauce, basil, salt, cayenne and pepper (the cayenne is 'to taste' - start with a 1/4 teaspoon, and add another 1/4 teaspoon if you like it a bit spicier). Peel and de-vein the shrimp. Give a quick rinse under cold water. Mix into the marinade. Cover and refrigerate for at least an hour. Soak the skewers in the water, in the cookie sheet. They will need to soak for an hour to ensure they don't burn during cooking. 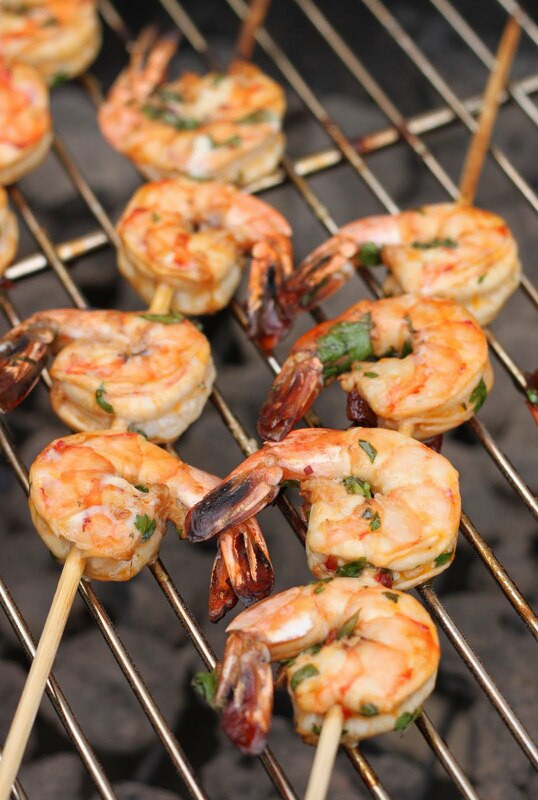 Note: If you are not using a BBQ, and just cooking the shrimp in a pan, you can skip using the skewers. Drain the water from the cookie sheet. After an hour - put the shrimp on the skewers (about 5 on each), threading the point thru both the head and tail. Lay the skewered-shrimps on the cookie sheet, and pour the remaining marinade over the skewers. Let it continue to marinade until you are ready to cook. Pre-heat the BBQ on medium heat. If using a pan on the stove top, heat the pan to medium heat. BBQ: Cook on the top grill, turn after 4 minutes. Use a basting brush to brush a little more marinade on while grilling. Pan/Stove top: Cook on medium heat, turn after 4 minutes (I always add the marinade to the pan, so the shrimps cook in the sauce). Cook until all white inside (about another 3-5 minutes). Serve hot. Place a little extra sweet Thai chili sauce , and/or plum sauce, to small bowls when serving (in case people would like dipping sauces).